Pomona’s 1919 Debate Club, including Arthur Williams 1919 (front row, second from left). The College’s second Black graduate, Williams would go on to become a physician in White Plains, New York. Desai: “… For the next three months, we’ll be investigating the questions about our school that we’ve had since orientation. What were relations like between the College’s founders and the original inhabitants of the land? How exactly did this decidedly New England-style liberal arts college get founded in the middle of Southern California? And what are the stories of the early students of color at the school? 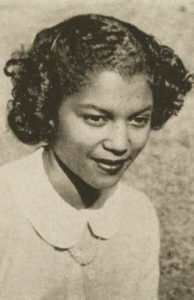 Williams’ daughter, Eileen Williams ’50, the first Black woman to graduate from Pomona College. Desai: “Right. Other schools have buildings and scholarships named after their first Black graduate, but I think it’s pretty surprising that Pomona doesn’t have anything, especially since he was the first Black grad of any college in Southern California. 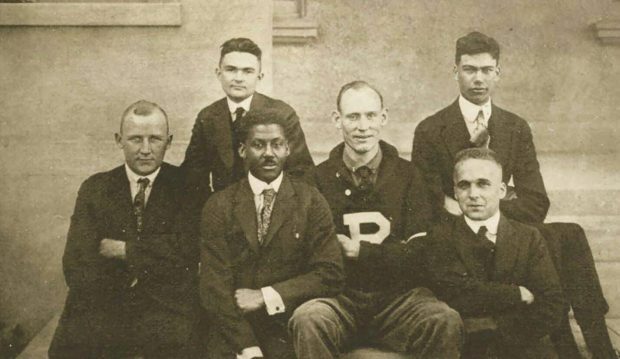 Anyway, after Winston Dickson graduated in 1904, it’s not like Black students suddenly became a frequent presence on campus. There wasn’t another Black student in Claremont for the next 11 years, when Arthur Williams enrolled at Pomona in 1915.